Rarely do motorcycle stylists serve up a bone fide 'game-changer' - one that not only raises the bar, but alters its very characteristics! The Ducati 916 was one such - taking two-wheeled visuals to another level. It was no coincidence that its designer was Massimo Tamburini. He had been a co-founder of Bimota - specialist builders extraordinaire! The Tamburini 'trademark' is all over the 916. All the way from its seductive snub nose - through the curves of its bodywork - to its pert tail-piece and silencers. It is so slim, it is scary! That tubular steel frame is not one jot wider than required. The 916 nudged the scales at 429lb - absurdly light for a bike of its size! In other ways, too, the 916 scaled new heights. Its torque-laden V-twin gave 160mph. Its chassis 'absorbed' corners! Lean it over as far as you dared ... you would not find its limits! The trick-looking single-side swing-arm said it all - technically, and aesthetically. As you would expect, such a classy package was a success, sales-wise. 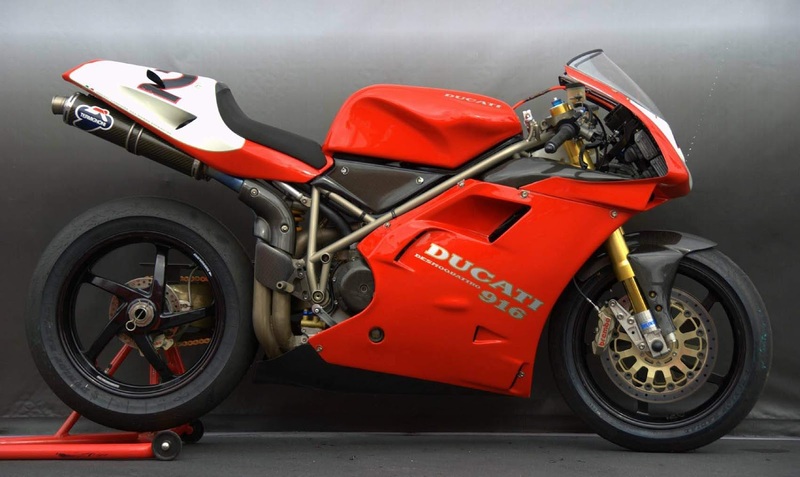 With the Ducati 916, Tamburini broke the motorcycle design mould!